MERCEDES — Madison Stambaugh, 10, struggles to hold on to her goat, Babycakes, as it wiggles around her, almost tangling her in its rope. Babycakes, who Madison confirms is usually this playful, won first place division champion in the 2018 Sale of Champions at the 79th annual Rio Grande Valley Livestock Show. “It feels amazing,” she exclaimed, still struggling to keep the award-winning goat still. 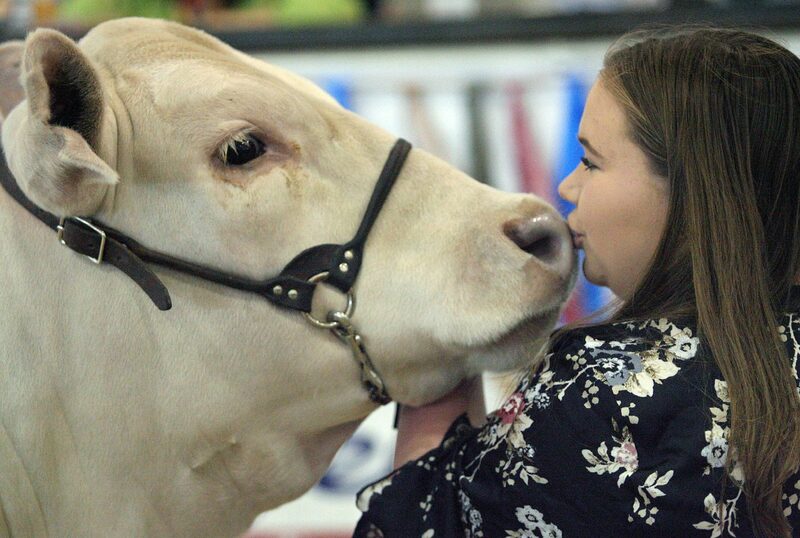 Throughout the school year over 3,000 exhibitors like Madison raised their animals with care, in the hopes that they’d bring home some gold at this year’s stock show. Of those, only about 300 made the list for Grand Champion, Reserve Grand Champion, Breed Champion and other placements. 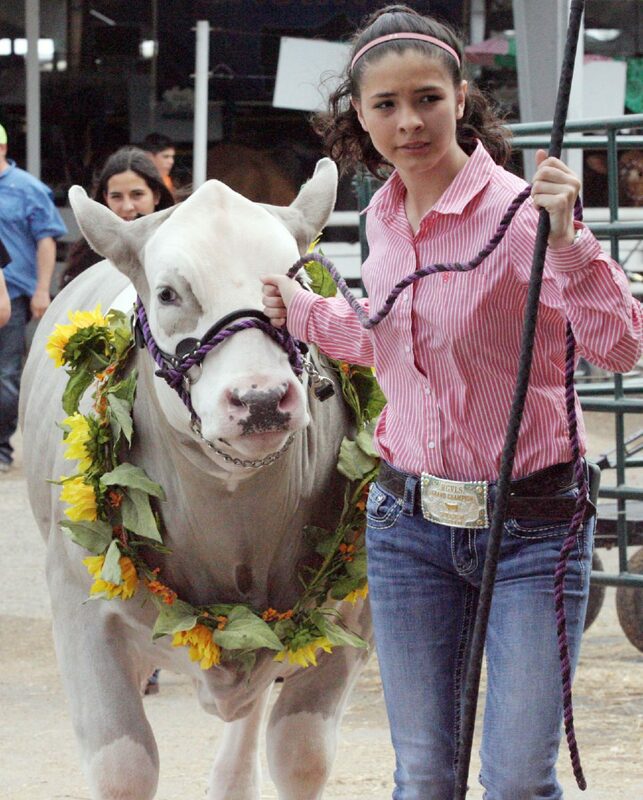 Danielle Rangel of Sharyland Pioneer FFA holds on to her Grand Champion Steer named" A.M.C" during the Rio Grande Valley Livestock Show 2018 Sale of Champions Saturday March 16, 2018, in Mercedes. 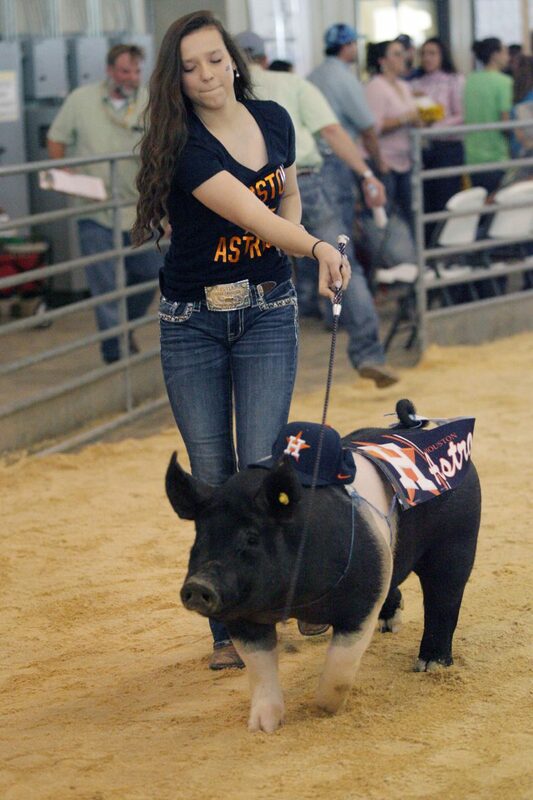 Caitlynn Cruz of Los Fresnos FFA, leads her Grand Champion Market Hog "Jose Altuve" during the Rio Grande Valley Livestock Show 2018 Sale of Champions Saturday March 16, 2018, in Mercedes. 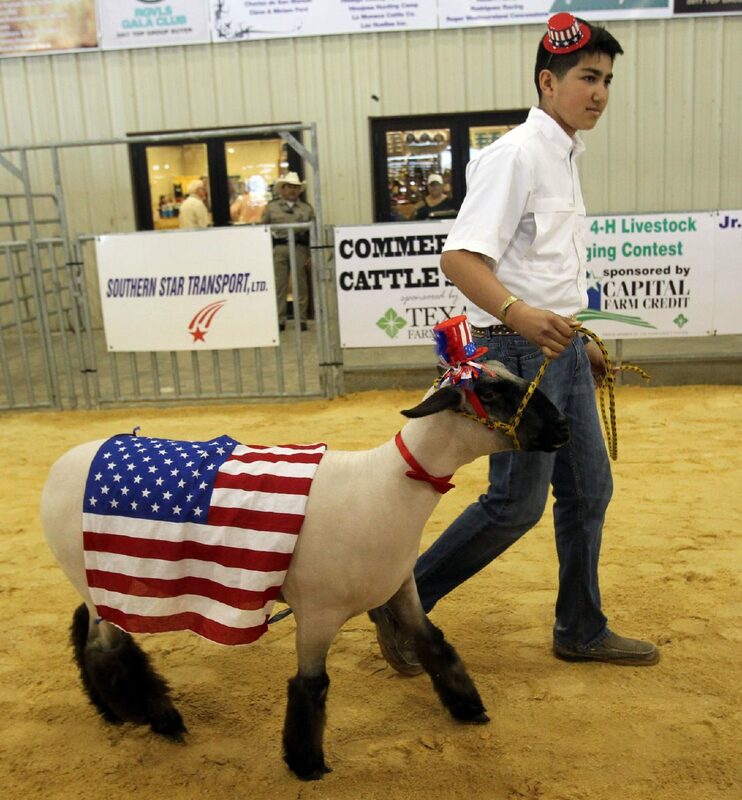 Wearing the Stars and Stripes, Joshua Munoz of Santa Rosa FFA leads his Grand Champion Market Lamb during the Rio Grande Valley Livestock Show 2018 Sale of Champions Saturday March16, 2018, in Mercedes. 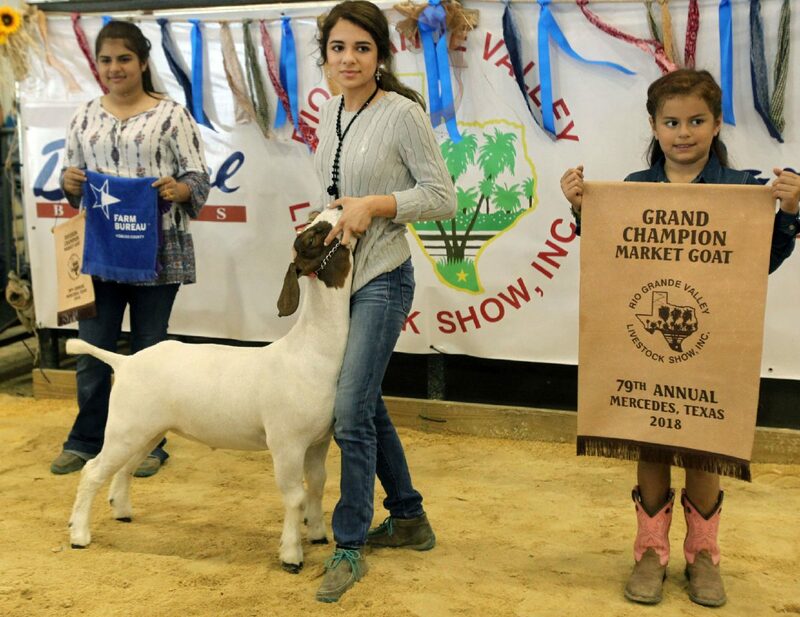 Grand Champion Market Goat is held by Melanie Faith Turrubiates of Sharyland 4-H during the 2018 Sale of Champions at the Rio Grande Valley Livestock Show Saturday March 16, 2018, in Mercedes. 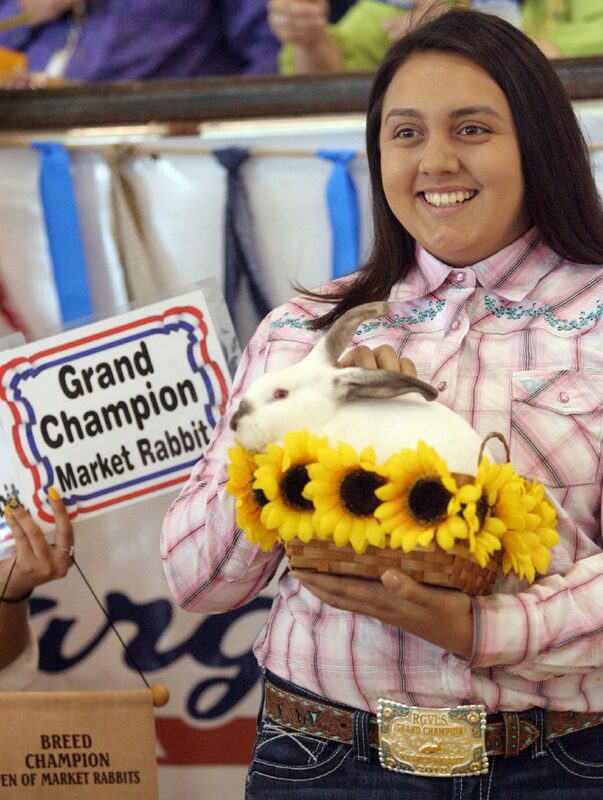 Grand Champion/Breed Market Rabbit, by Harley Guzman from PSJA Memorial FFA during the 2018 Sale of Champions at the Rio Grande Valley Livestock Show Saturday March 16, 2018, in Mercedes. “There’s a lot of dedication and hard work that goes into this,” said 13-year-old Kayla Rodriguez of Harlingen. Kayla’s hog won second place in its division, which she said is a product of many early mornings and long days spent caring for the animal. The most anticipated award every year is the Grand Champion Steer. This year, that went to Danielle Rangel, 15, of Sharyland Pioneer High School. 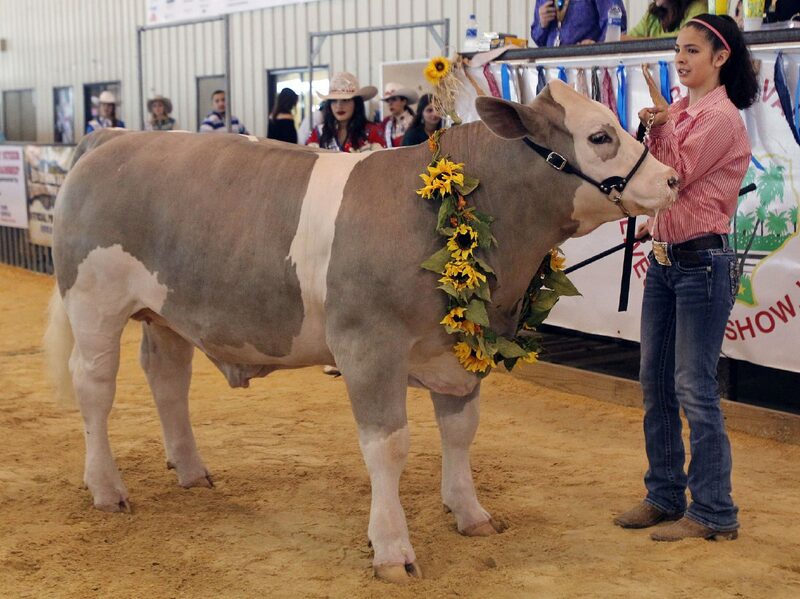 Danielle’s steer — which she decked out elegantly with a sunflower necklace — weighed 1,325 pounds and sold for $21,000. “It feels good to know that you can raise an animal that can win a big show like this,” she said. In the past two years, the RGVLS has awarded $1.6 million in scholarships to students like Danielle. She plans on attending Baylor University, and hopes to join their basketball team while there. She’s been showing animals since she was in third grade, so she’s gotten used to parting ways with the animals she raises. Even then, it’s not always easy.